Another basic map, although it has a wierd resource layout. I added fog for the hell of it. Enjoy it or...not. you can build off of your allies con, so like, this is negated. and they are on opposite teams on a symmetrical map....aka "balance"
how bout sum unholy alliance? Hows about I do every single map? Including the campaign ones. And all the fan ones too? Nice map! 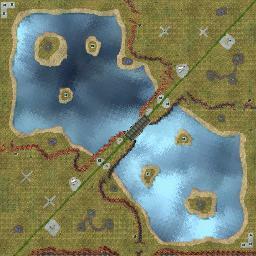 But as I said before: it's best to take the original map sizes, multiply them by 3, and then re-create the map. Then you have some more room Or are you already doing that? Funness and playablilty is everything.